All of us have, at one time or another, fantasized about what it would be like to have a personal chef. If I could have my way about the matter, the person I would choose to be mine is Miyoko Schinner. What perfect timing for this giveaway – I just returned from the festive book launch party for The Homemade Vegan Pantry held near San Francisco, California. 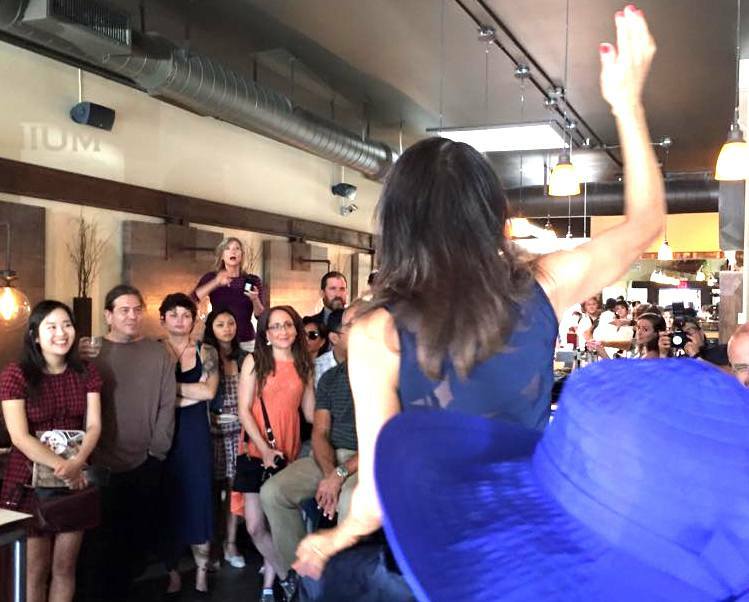 Packaging up artisan vegan cheese in Miyoko’s kitchen – before the launch of Miyoko’s Kitchen! I’ve had the great good fortune of not only eating at Miyoko’s table on multiple occasions, and of course eating piles of the cultured-nut cheese from her kitchen, but I’ve been able to observe first hand how she ‘throws things together’ with phenomenal plant-food-on-your-plate results. Take the time I was helping her set out a display of artisan vegan cheese and apples, and she asked me to slice the apples. I was slicing away in my usual fashion, when I noticed her looking at me quizzically. Very kindly, she said “Here, let me show you….” The tip she taught me about how to do that quickly, easily, and to create a beautiful display at the same time, made me realize I’ve been in the dark ages when it comes to something as simple as slicing apples. And it made me wonder what else I’ve been doing that I could, well, do so much better! Yes Mom, you gave me a solid foundation in the kitchen. But Miyoko has some chef skills that you would just love. Which is why, when Miyoko told me about the new book she was working on – The Homemade Vegan Pantry – I immediately knew that this was going to be of great value to me – and you. What won’t you find, is more like it. Cake mix, pancake mix, sauces and condiments (ketchup, mayo, pesto, and jame – just to give you an idea of the vast variety included), dairy and egg-free baked goods, veggie dogs and burgers, and an entire line of desserts – it’s all here. I’ve had a shot at many of them and been pleased every time – including the chocolate cake and baking mix – which I get to share with you right here. The primary focus is veganizing everything, with healthy ingredients as an important consideration. At the same time, you will find some recipes with sugar and oil – as a matter of fact the cake mix calls for oil in the mix-together phase. But I found it was an easy work-around, and simply used pune puree instead. As a matter of fact, in The Homemade Vegan Pantry, this same chocolate cake mix is used for making “Oil free muffins or cupcakes” using ripe bananas or applesauce – so if you are eating and baking oil-free, you’re all set. I know that Miyoko rarely uses oils in her own cooking and knew for that reason that this would probably work. The idea of Homemade Vegan Pantry is to give us some quick, easy shift tools to veganize familiar favorites and create scrumptious family favorites for family and friends alike. This is a real advantage to you as you keep winning hearts to plant-based living. To get a sample recipe into your hands right away, here is the Chocolate Cake and Baking Mix from The Homemade Vegan Pantry. If you’re looking for that perfect chocolate cake—rich, complex, but light— look no further. 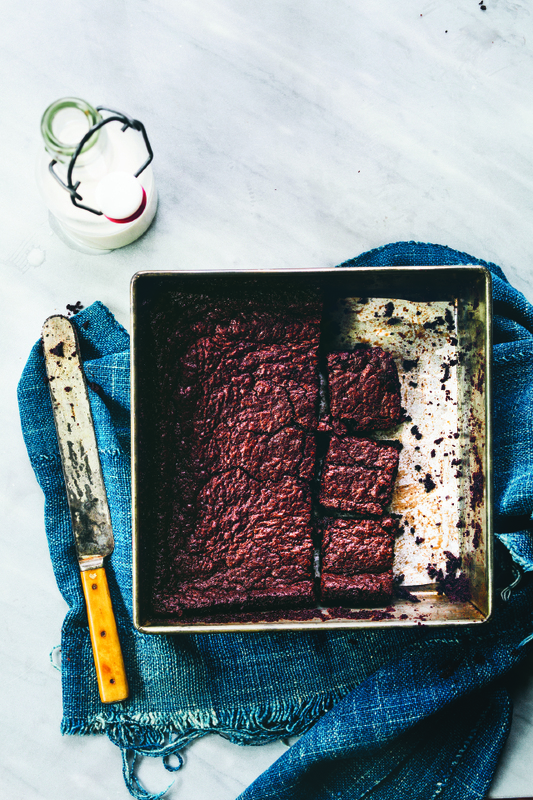 How about deep, fudgy brownies (pictured)? It’s right here. Or almost guilt-free and oil-free chocolate muffins? Got those covered, too. Best of all, if you have kids like mine who tell you at ten o’clock at night that they need a treat to take to school the next day, you’ll be the supermom who can whip out amazing desserts “from scratch” in moments. Sift together all of the ingredients into a large bowl, then using a wire whisk, mix well until the mixture looks perfectly combined. Alternatively, you can use an electric mixer or food processor. Store in an airtight container or ziplock bags at room temperature for 3 to 4 months. Ever so light and delicate, these laers will make an unforgetable cake sandwiched together with French Buttercream (recipe in book) , Fluffy French Chocolate Buttercream (also in book), or as I did for my birthday cake this year – layered with plant-based ice cream! Preheat the oven to 350 degrees. Line cake pans with parchment paper and grease or spray the sides with a light coating of oil, or line a 12-cup muffin tin with paper liners. Put the mix in a medium bowl. In a separate medium bowl, combine the boiling water with the oil, vinegar, and vanilla and pour it into the cake mix in the bowl. Whisk for at least 30 seconds. Pour the mixture into the pans or cups and bake for 15 to 20 minutes, until the middle is springy to the touch. *Note from me: I replaced the oil with prune puree. Makes two 9-inch round or one 8-inch squary cake pans, or 12 cupcakes. My birthday cake and ice cream. For my birthday this year I made Chocolate Cake from The Homemade Vegan Pantry Chocolate Cake and Baking Mix. My jar of ketchup from The Homemade Vegan Pantry recipe. I served it with a generous scoop of Mandarin Chocolate Ice Cream (recipe coming to you soon in The Plant-Based Journey) and found ourselves in crowd-pleasing ice-cream-and-cake birthday party perfection. 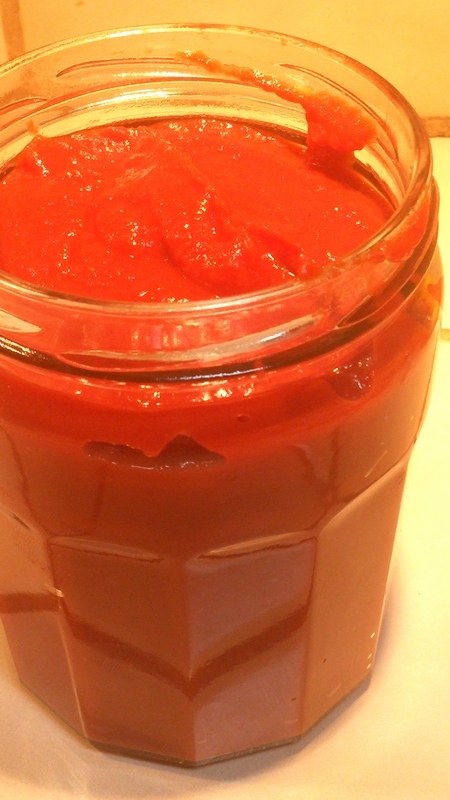 I’ve tried other recipes from as well, including Miyoko’s easy Ketchup recipe. That explains the funny photo, below, that showed up on facebook not long after. I’m shameless about enjoying good eats. I have a copy of The Homemade Vegan Pantry for one lucky winner. Follow the instructions below to enter, including posting a short comment in the Comments and Replies section further down this page. Contest ends at midnight eastern time on Monday, July 20th. U.S. residents only, please. Good luck! 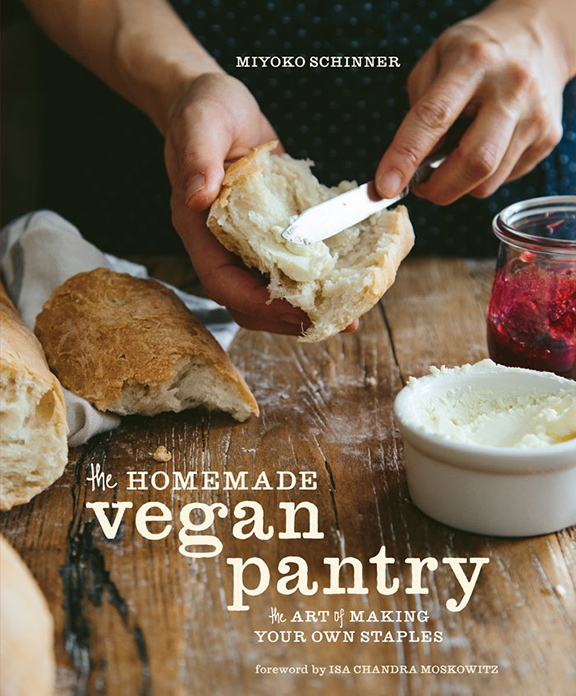 *Reprinted from THE HOMEMADE VEGAN PANTRY Copyright © 2015 by Miyoko Schinner. Published by Ten Speed Press, an imprint of Penguin Random House LLC. © 2015 by Eva Kolenko. Published by Ten Speed Press, an imprint of Penguin Random House LLC. I love to take fresh apricots (preferably home grown) and lightly cook them into a sauce that I freeze for a special treat later in the year. I like to mix raw cacao powder, coconut oil and agave or maple syrup for homemade chocolate sauce. A faux parmesan that I put on just about everything. Like the idea of pureed prune as the oil sub.. Looking for a sub for the dry sugar. Would love to make my own ketchup. Store bought is so bad! I make my own vegan bread in the bread machine. It’s easy. Thanks for the chocolate cake mix recipe! This book sounds really handy! Various flavors of pancakes are my fave on Sunday mornings. YUM! I love to make a mango & jalapeno braising sauce for braising chicken. I use up all my softening produce by making homemade sauces or soups. My favorite condiment to make is mayonnaise. I like to make my own salad dressings. I use just a small amount of olive oil and add in some type of vinegar, dijon mustard, lemon juice, and seasoning. I’d like to make my own ketchup since I don’t use it too often and don’t need a large bottle of it like those sold in stores. Right now I pretty much just make vegan mayo and dressings. I’m experimenting with sauerkraut too though! Would love to try making a homemade ketchup. I would like to make my own ketchup! I love the chocolate cake recipe. 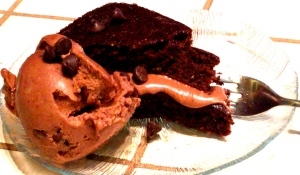 It reminds of the famous “wacky cake” my mother -in -law made…but of course much healthier! To be able to whip together a chocolaty treat that much healthier sounds like a dream! Just out of the hospital with a severe asthma attack and want to back off the dairy. Need to really. This book looks like a natural for my cookbook collection! I cannot wait to make it. It is almost like a recipe of my mother from the time so many things were rationed. And to have the mix ready to go will be wonderful! I like making “vegan Parmesan,” using walnuts, miso paste & nutritional yeast. Good sprinkled on salads, topping baked potatoes, over savory greens & grain dishes. I cannot wait to make more vegan recipes with this book! I want a good recipe for ketchup! I have a vegan brown gravy that I make that is delicious! Because of previous vegan cookbook purchases, Amazon had already recommended this book to me. That, coupled with your glowing comments, has convinced me that this is the next cookbook to get. Maybe I’ll win it!!! I make my own soy yogurt. So delicious and has much less sugar than store bought. I use it for baking, as a topping for my overnight oatmeal, in salad dressing recipes and as a topping for fresh fruit. I love to make my own plant milk, usually almond, soy or hemp. It’s so inexpensive, and so easy! 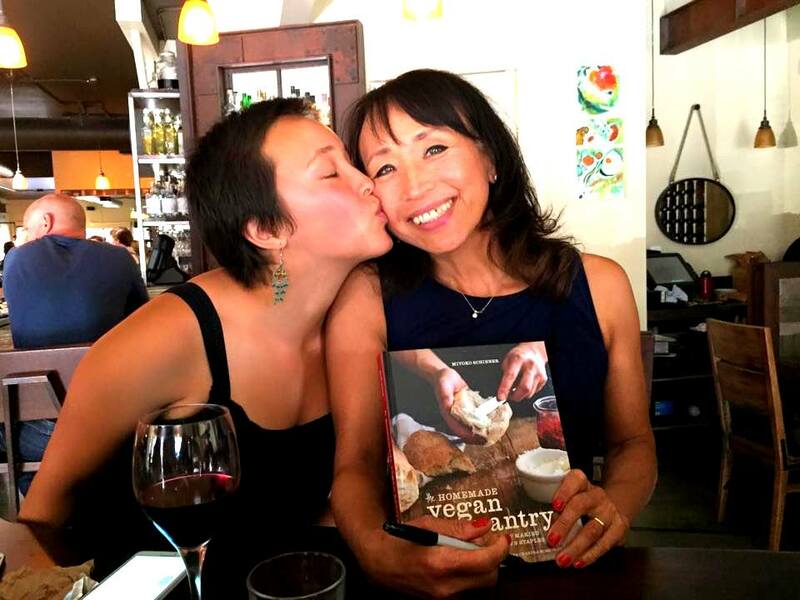 By the way, Miyoko’s new book sounds like just what I need as I continue to gently nudge my family into the plantbased lifestyle! Julianne, I admire that you make your own plant milk! It always sounds easy but I just haven’t gotten around to it. And yes, this is the perfect book for putting the ‘standards’ in veg speak to bring your family along. Smart cook! This book doings great! I will have to check for it on Amazon or Batnes and Noble. Hmm, maybe I should wait to see if I win first!! I need a great recipe for vegan chocolate waffles! My 9 year old daughter would love them! Mmmm, now that sounds good! By the way, have you ever made mochi waffles? You can buy the flat bricks of mochi in the natural foods store – they make a chocolate brownie flavor – and cook it in the waffle iron after cutting it into squares. It’s crisp on outside, chewy inside. Wonderful! Great idea Dianne! It really makes a nice dark cake. Let me know how it comes out and happy birthday to your daughter! How old will she be? I like to make Golden Milk. Sandra, what is Golden Milk? Curious! I like to make salad dressing – so much better than anything bottled, and I know exactly what’s in it! The book looks wonderful! 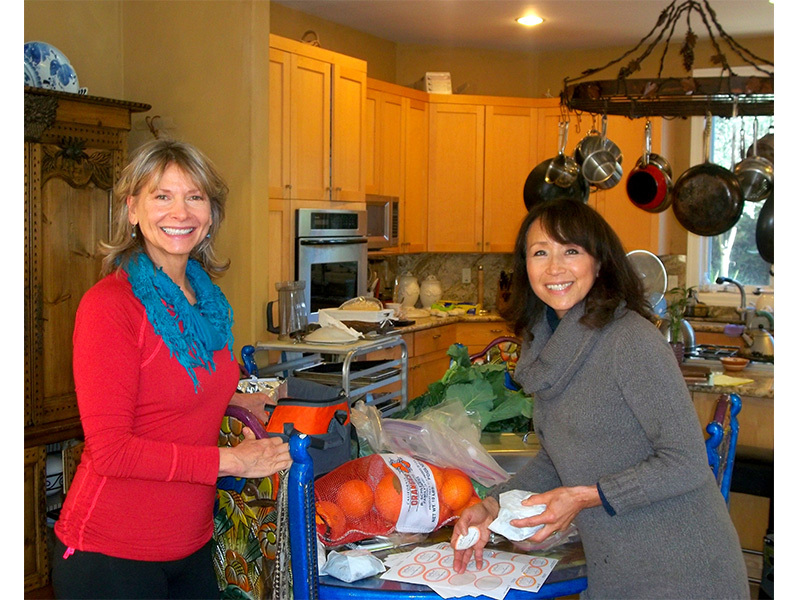 Barbara, there are several great dressing recipes in here – and Miyoko also contributed one to my book The Plant-Based Journey, isn’t that cool? The login up there did not let me comment. So, it’s not letting me enter. :^( I love Miyoko Schwinner’s cheese book. I can’t wait to see this one. At our house we love to make our own vegan cake, and pico de gallo. We also make hummus. Bethery, you weren’t able to login? Do you mean to the Rafflecopter box? Please let me know what message you get – or, try a different browser first? Sometimes I have to switch from Chrome to IE to get into some things on some sites, though not on mine. Let me know. I have Miyoko’s excellent Artisan Cheese cookbook. This new book sounds wonderfully functional. Boy, do I need this! I know mine (and my husband’s) health would improve dramatically if I could finally kick all the processed junk to the curb. Oops! Didn’t see the topic until I had already posted. About the only thing I’m any good at is making fresh salsa. I like to make my own mustard! We should all be shameless about eating vegan 🙂 Thank you for being a leader in this effort and enabling us to be healthier and eat better too! I am going to try the cake recipe (I have been using the no-oil Wacky Cake recipe in the 21 day kickstarter program) but this one has coffee, yummm!! Can’t wait to try it, and see more of this wonderful new book. Tammy, I agree. Shameless and by the way, at the Homemade Vegan Pantry party I sat next to a food lawyer at dinner (food, politics, and policy) and she is unwavering in opinion that ‘vegan has now gone mainstream’ – and she seemed tough and conservative! 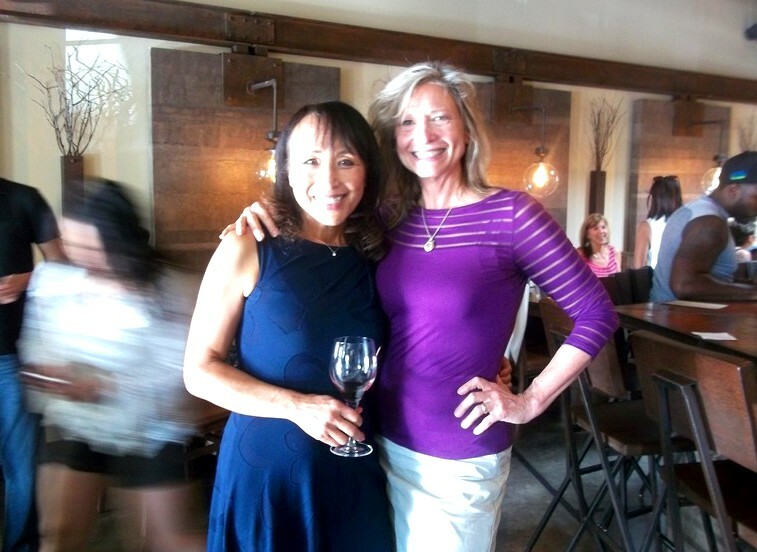 Are you ‘leader’ words to be passed on to Miyoko, or for me? I couldn’t tell for sure and didn’t want to assume! As for Wacky Cake, it’s similar also to the recipe I learned in high school Home Ec class, “Crazy Cake” – but the coffee wasn’t in that one either! Let me know how it comes out when you try it! Pancake mix is my treat! Can’t wait for this book!!! I always make my own mayo and hummus. Buckwheat waffles with berry sauce. Would love idea for a premeasured soup mix. And breakfast pancakes/waffles. I like to make spicy ketchup with either jalapeño or chipotle. It tastes so much better than the store-bought version and is much healthier. I am learning :0) This past week, I found an old, Mennonite sugar-free cookbook at a garage sale. It is a relatively thin compilation on all things to do with healthy eating. I am curious to try an apple juice based pancake syrup recipe this weekend! Ashley, the date puree would probably work fine yet it is very sweet, while the prune is a little more moderate in sweetness. Let me know if you try it!